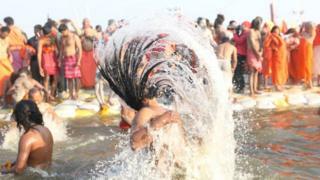 Kumbh Mela is huge festival attended by millions of Indiana and other nationals to foster religious belief. Officials and organizers said some 15 million people bathed on Tuesday. They expect about 120 million visitors over 49 days of the whole duration of the festival, which considered as the largest festival in the world. In fact, Sadhus – or ascetics – smeared ash on their bodies as they came out of the water and chanted “Har Har Gange”, or “Mother Ganges”, and danced while posing for photographers. Furthermore, the Naga sadhus are the biggest draw of the festival – held in the northern city of Allahabad, recently renamed Prayagraj – and arrived early in the morning in massive colourful processions.